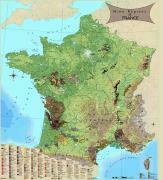 Map Gifts from Omnimap, the leading international map store with 250,000 map titles. We have many great gift items, suitable for holidays, birthdays, Mother's and Father's Day, graduation or just about any special occassion. We have items ranging from a few dollars - envelopes and note paper made from old maps - to spectacular globes for the homeoffice. In addition to the gift ideas below, any travel or hiking map or hiking guide can be a great gift - a map to remember a trip past, or for planning a trip to be. Items such as fishing maps, DeLorme road atlases, and topographic maps from around the world are part of the over 250,000 maps in our map listings. Please start at www.omnimap.com/maps.htm. A selection of beautiful antique-style wall maps for Caribbean islands and other areas. Topographic maps for the entire USA. Forest Service maps for National Forests and Wildernesses across the USA. National Geographic Society Wall Maps. World famous maps perfect for the student, the home,office.